King Kalakaua, the elected 'Merry Monarch' was the first monarch to circumnavigate the globe in 1881. The image shown here is during his visit at the White House. Queen Lili’uokalani was drafting a new constitution to replace the forced 1887 Bayonet Constitution, to restore the veto power of the monarchy and voting rights of economically disenfranchised native Hawaiians and Asians. Iolani Palace was the first royal palace with flush toilets, had the first networked telephone system and in 1886 had electric light four years before the White House. The Kingdom Seal still on the palace gate with the motto that means "The life of the land is perpetuated in righteousness." Four conditions define a nation: Territory, Population, Sovereignty, and Government. A lawful Hawaiian Government was formally reinstated on March 13, 1999 in Punalu’u, when a government pro tem was established in accordance with public international law and Hawaiian Kingdom Domestic Law. This re-established government fulfilled the position of obligation taken by the United States of America in U.S. Public Law 103-150, which explicitly admits that “…the indigenous Hawaiian people never directly relinquished their claims to their inherent sovereignty as a people or over their national lands to the United States, either through their monarchy or through a plebiscite or referendum”. In fact, Queen Lili’uokalani formally protested the illegal overthrow of the lawful and peaceful Hawaiian government by foreign commercial interests with unauthorized American military support. At that time, Hawaii was the most literate nation on Earth, and over 90% of the citizens, of both kanaka maoli and kanaka ‘e, signed a petition supporting restoration of the Kingdom. Today, the Hawaiian people are the most incarcerated nation on the planet. Their literacy and their state of physical health is also a mere remnant of what it was before the overthrow, crying to Heaven for restoration of the fifth, and first indigenous, non-European member of the Family of Nations in 1843, invited by both France and the United Kingdom. The first formal act of the kanaka maoli gathered to reinstate their lawful self-governance was to pule, to circle in prayer. They asked Uncle Robert of Kalapana, the steward of Saint Damien's sacred vestments, and whose farm was surrounded on three sides by lava fields higher than the stone walls where it stopped at his property line, burning the bushes, but not the blessed brown scapulars placed for spiritual protection on the rock wall, to lead the prayer. Present were also 5 witnesses, who are non-kanaka maoli Hawaiians. These included Rev. Dr. Glen Swartwout and Rae Luscombe. Also present from the Moku of Hawaii, was an attorney, Lanny Sinkin who now serves as counsel to King Kelii Silva. 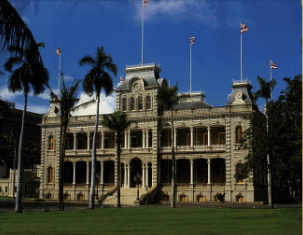 Following re-establishment of the Legislative and Judicial branches of the lawful government, Dr. Glen and Rae also witnessed the Coronation at Iolani Palace, the second such coronation Dr. Glen has been graced to attend at the royal palace, the first being that of Akahi Nui on February 22, 1998. 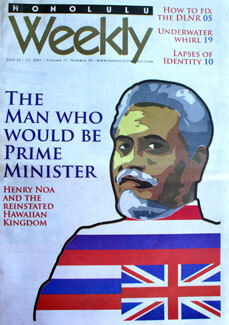 In 2012, Dr. Glen was appointed by a third King, Keli'i Silva, to sit on his Celestial Council. King Kelii's plan for restoring the garden that is Hawaii includes 80% of the budget for restoration of food sovereignty. Before contact, Hawaii was home to multiple Kingdoms, and in the Truth, each self-governing soul is a portable territory of traveling real estate (originally "royal estate"), with a fractal image of the divine sovereignty over a population of trillions of living cells, and the constituent hierarchies of angels of which our biological body-suits are continuously being re-formed. That is why God is King of Kings. We are the Kings and Queens of our very nature, here now to restore the Garden, the Kingdom of Heaven. The statue of the Merry Monarch is a few blocks from Riverbend House, home of Hilo Oasis. If you see the man who looks like this at The Shire, it is Glendalf's brother Frank P. Swartwout. Dr. Glen Swartwout was invited to Hawaii, forming a Hui with a Hawaiian family whose matriarch was raised by her grandmother on Oahu in the lineage of Pele's heiau at the coast below Kilauea volcano. At the time, the heiau was still in a kipuka surrounded on all sides by new lava flows. From that vantage point, one could see the twisted steel beams of the old visitor center of the Hawaii Volcanoes National Park. When Dr. Glen's Hawaiian Kumu moved to Volcano Village from Oahu in 1959, the day she moved in was the day of the Kilauea Iki eruption that fountained lava nearly 1,900 feet in the air. We live in the Once and Future Kingdom of the 2D Fractal Branes with supercluster bilayer coherence zones as the surface receptors of the cosmic cells of Grace: that energy which is dark to the mind that would harness it to its ego, but transcends all bright beauty in the eyes of the heart. For while beauty is that coherence of the divine substance which sustains the swirling winds of time, grace is that ever dawning beauty toward which Time himself is ever drawn. Perhaps it is our hearts, our love, our transcendent ascent to what is, what has been, and what still shall come to pass, that helps to carry the current of grace between branes, which draws time. Time's true lover is our Future Selves, those Kings and Queens of this interior Heaven, this sometimes fractured but always fractal castle, this Haven of care that is our Ark at our very hands, each of us fully for this divine suit of self, yet not alone, each for the other, this divine family of God, in this divine fractal cellular body of quantum coherent plasma-condensates.